Scientists have identified a protein that helps detect DNA damage in developing eggs. They believe the protein, p63, may play a key role in killing off defective eggs and ensuring only the healthy ones stand a chance of being fertilised. The Harvard Medical School team believe the insight into the quality-control process could lead to advances in the treatment of female infertility. Human eggs, or oocytes, start developing before birth. Specialised precursors begin to undergo meiosis, a type of cell division that eventually yields a mature egg containing just one set of chromosomes. But the process, which then grinds to a halt and is finally completed after puberty, can take decades. The Harvard team showed that p63 is expressed in developing mouse eggs during this period of meiotic arrest. The protein is very similar to another protein known to suppress tumour development, p53. But the researchers established that it was p63, and not its cousin that was responsible for weeding out defective eggs. They exposed eggs cells to radiation to cause damage to the DNA. Cells lacking p63 survived, suggesting the weeding out process was flawed. However, cells lacking p53, but producing normal amounts of p63 were killed off. Lead researcher Dr Frank McKeon said: "Thus p63, and not p53, is the critical factor for monitoring the level of DNA damage in oocytes and deciding whether it is better to kill them rather than risking the transmission of mutations to the next generation." Dr McKeon said his team's genetic analysis suggested p63 evolved specifically to protect egg cells from mutations at least 800 million years ago. 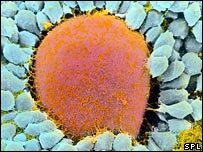 Dr Allan Pacey, senior lecturer at the University of Sheffield and Secretary of the British Fertility Society, said: "This is an interesting paper which sheds light on the process by which the ovary can quality-control the eggs it contains to make sure that damaged ones are not ovulated. "The production of eggs is more complex than sperm production because the immature eggs remain in the ovary for such a long period of time. "This makes them vulnerable to DNA damage which could lead to infertility or affect the health of any babies born if there is not a process to repair or remove them before ovulation." "This work helps us to understand the egg quality control process better and might one day allow us to understand why some women have fertility problems because of the poor quality of the eggs they ovulate."